Tokyo Ghoul is a dark fantasy Anime series by Pierrot Studios which is an adaptation of the manga of the same name. It is about the dark thematic world in which Ghouls and human synchronize. The story revolves around Ken Kaneki, university freshmen. Kaneki is the typical shy, nice guy.He is the bit of a stooge and a bibliophile. His go-to place is a local cafe shop Anteiku located in the 20th ward where he is usually found with his best and only friend Hideyoshi (Hide) enjoying a cup of coffee and stealing a glimpse of his crush Rize. After a close encounter with a Ghoul which made him a hybrid (half ghoul and half human) and nearly killed him, kaneki wakes up in the hospital room with a realization that something isn’t right. His new transformation was a bane for him and turned his life upside down. So, basically, the Plot hinges on Kaneki entering into the world of Ghouls while striving his best to hold on to his human side. The protagonist of the story Ken Kaneki is anything like the other exemplary anime protagonists. He is a pushover who doesn’t want to fight for the most part of the season but shows some serious character development at the end. He has a crush on a girl named Rize. Somehow his and her destiny interchanges after a shocking turn of events. This story took place where the city of Tokyo is divided into wards and there are Ghouls who haunt them. Ghouls are carnivores, cannibalistic creatures who are often disgusted by the people. Outwardly, they are like humans. They have the same physical appearance and intelligence as humans what separate them is their diet mostly and inner biology. Ghouls could only eat human flesh. They are stronger and have a cool distinctive feature ‘Kagune’-predatory organ that functions as the weapon which helps them to defend and attack. They wear masks to disguise their identities. Some Ghouls even attack other Ghouls just to prove their superiority. This series also have Anteiku coffee shop composed of ghouls who acts as silent guardian of the 20th ward. They take in injured ghouls provide them food, shelter and take care of them. The Antagonist (kind of ) of the story comprises of the Commission of Counter Ghouls (CCG).It’s an organization formed with the sole purpose to make the Tokyo city Ghoul free.For this, they have specially trained Ghoul investigators known as Doves. Doves use ‘quinque’- the special weapon which resembles the ghouls kagune to capture them. 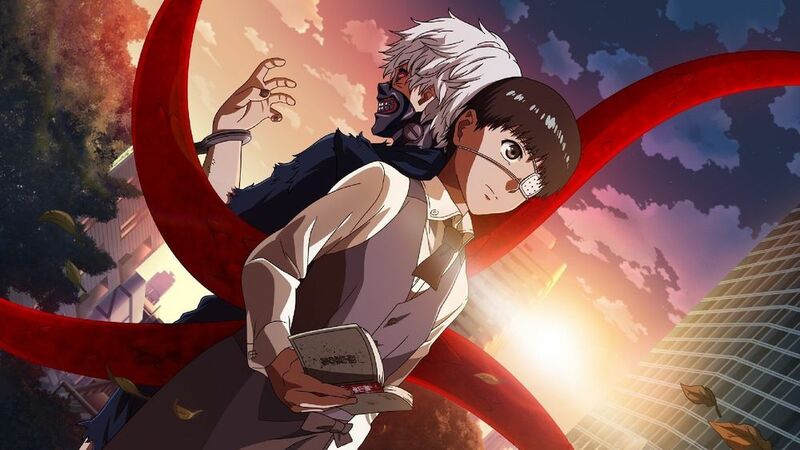 Tokyo Ghoul is plot driven, has depth and does a wonderful job in shedding light on some sensitive issues. It shows us good could be found in the creatures like ghouls and even they could have a humane side. It has a gripping story which will leave you awestruck and question the perception of right and wrong. One thing I didn’t particularly like about Tokyo Ghoul is they way it ends on a cliffhanger (can’t we have just 2 more episodes).It is bit Shonen and shows some tonal dissonance. The series lack humor and tries to show too much in a little time of 12 episodes. This Anime has an amazing soundtrack. Both opening and ending songs Unravel by TK from Ling Tosite Sigure and Seijatachi by People in the Box captures the essence of the anime perfectly. The voice actors are great. The animation design suits the anime completely which makes the fight sequences a treat to watch.